Are You Running a Constant Travel Race? This question is truly unanswerable without at least expanding with a few thoughts and looks to what’s happening around me. Everyday I’m seeing truly wonderful people travel all over the world for a living and will admit that it’s stirring up a bit of jealousy. They’re out there blazing trails that I’ll never reach and if you’re one of these awesome people, more power to you. You’re living the dream but like a friend of mine recently noted, not everyone can travel all the time. Travel is beautiful and liberating in so many ways but is it becoming too centered around how many and how long as opposed to how you felt during and after? Is the act of traveling becoming a never-ending game of constantly upping the ante? 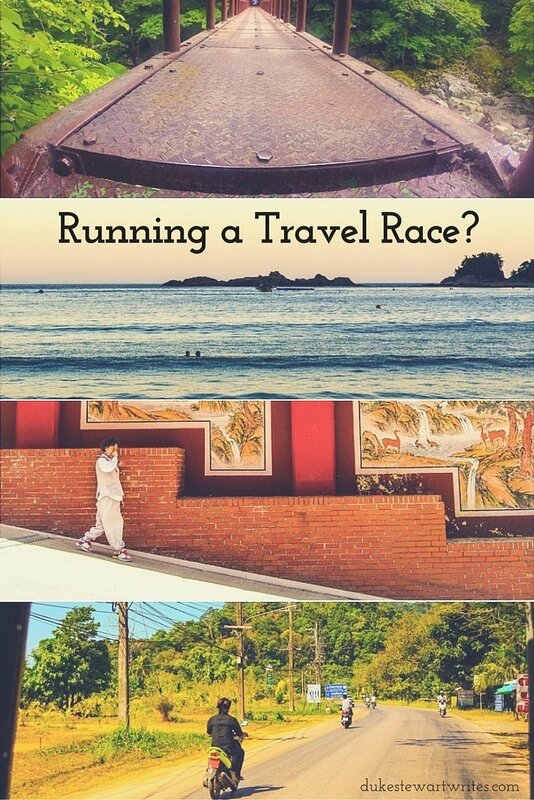 Are you running a travel race? Maybe it’s all these ads and promotions that are telling you about the latest and greatest uncovered gem to visit. That’s where travel race begins and forces us to think of travel as only something possible via plane, train or bus. Long-distance journeys are viewed as either an annoyance or a thrill and I’m with the latter crowd. 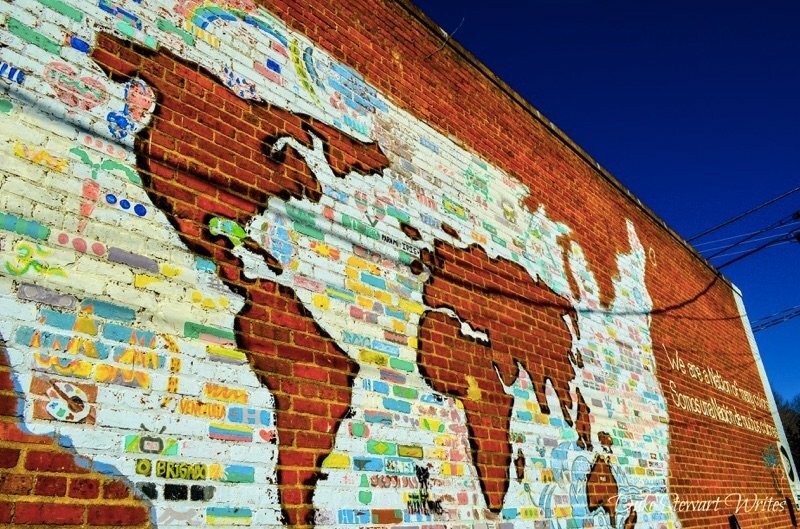 Even so, is that the only way to consider yourself to be traveling? Is it impossible to find similar joy in slower-paced ways of moving around? I know there are people out there extolling the virtues of slow and local travel so why aren’t more people giving it a shot? Has traveling in our own countries become too vanilla or meh? Some of us are unable to splurge on a plane ticket as often as the race demands. I’ve never been a full-time traveler and if not for teaching English in South Korea and a study abroad stint in Japan, I might’ve never left home. Living abroad did change the way I thought about home and gave me a renewed interest in the places where I’ve once lived. Of course people have said that it’s just because I’ve come home with sharpened curiosity after going away. That might’ve made sense within the first week or two of me being home but what are they going to say when I’m approaching month six or a year of feeling inspired about local travel and micro adventures? Is the problem lying in our own expectations? I always see pictures and people commenting on them about such and such place and how it’s now added to the “list.” We’re always adding stuff to that burdensome bucket list without really taking a look at it. Think about why you’ve created this huge collection of places and if it’s more of a heavy weight hanging over you. Is it there for you to actually complete or do you even remember how it came to be? I don’t want you to give up on the list but at least want to point out the pressure that comes from the exercise. Let’s try another one if you don’t mind. Print out your bucket list or write it down on a piece of paper. I know nobody uses paper these days but try just for me, pretty please? Do me a favor and break that bucket list down and dissect it. Think quickly or deeply and then go out and travel the way you want. Don’t worry too much about lists and ticking things off them when you should just be taking them one by one and enjoying the hell out of them! You can even love a place so much that you go back and see it as many times as you want! Have you ever considered just keeping one place on that list? Or what about writing things down one at a time and going against the bucket list altogether, traveling at your own pace? That would kill this “travel race” mentality that’s everywhere today. The first step is for us to stop looking sideways towards the other awesome people in this world and focus on ourselves. What do you think about that? I know that from now on, I’m going to look ahead at my own finish line and leave the travel race to those who can keep running. 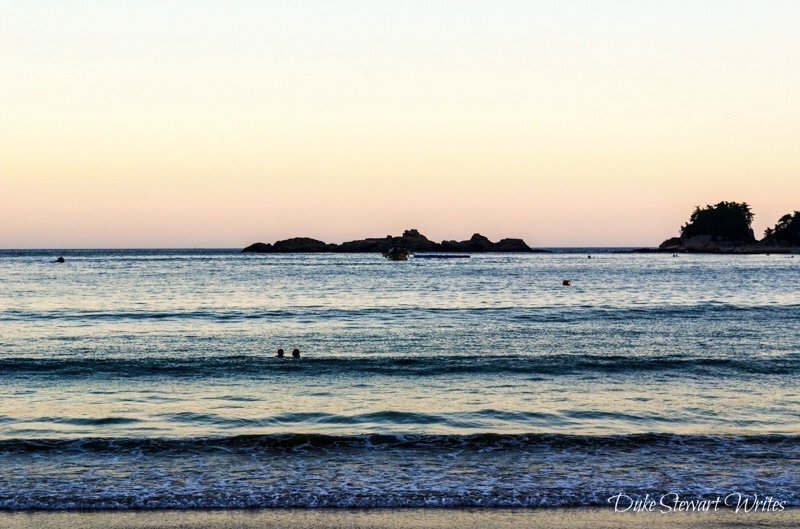 Are you with me or still convinced that you should tick off all those points in your bucket list? Either way, I hope you achieve your dreams and find the end that you’re most satisfied with someday. I know I will. 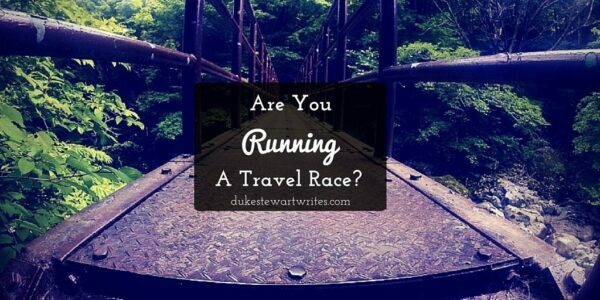 Are you running a travel race? Are you okay with that? No matter where you stand, I’d love to read your thoughts in the comments section. Note: All photos except one were created during a local travel experience, either when my wife and I were living in Korea or after returning home. 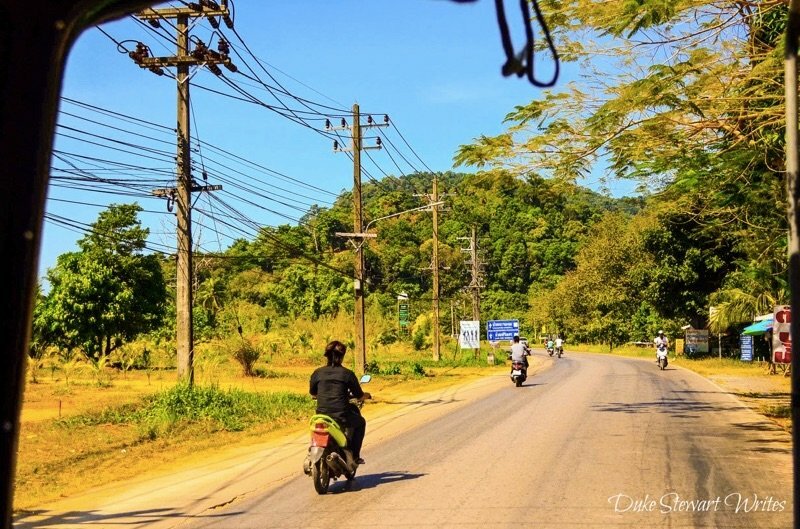 The one with the one of motorbikes in Thailand is the lone exception. Great article Duke, I’m sure this happens a lot. 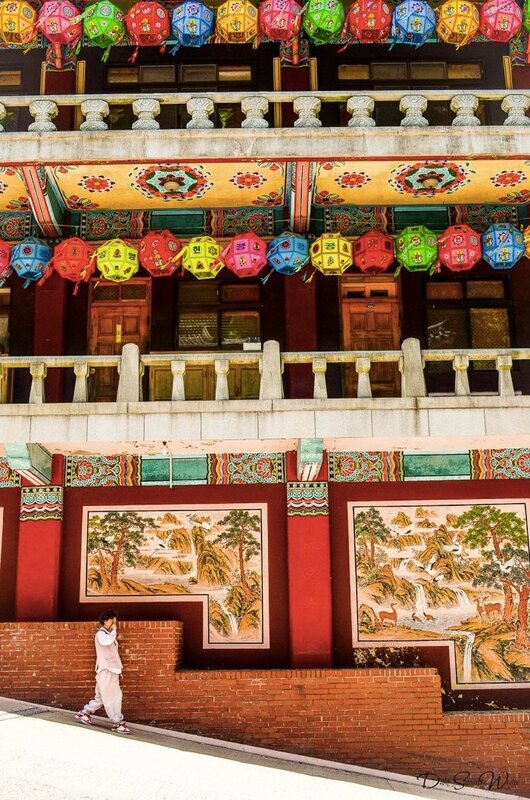 We made a big move by emigrating to Hong Kong last year (we’d lived there before in the dark and distant past) mainly because we like Asia and it’s a good place to be – oddly the ‘travel’ thing never really came in to it, it was a lifestyle choice and a good one too ! We no longer feel the need to go off exploring all the time, sometimes familiar territory does the trick and at a slow pace too ! Enjoy ! I have been recently thinking the same. I am close before a visit to Usbekistan and I want to be honest: Part of the reason for my visit is the fact that is so little known and I know I will be able to take awesome pictures for my blog and social media profiles. Last weekened, while I had a little off time at the spa (in austria…gee jeset baby!) I was thinking why I was even bothering. I do kinda feel like I am exactly on what you describe – a travel race. Funnily enough I even started outlining a little article about it. On the other hand I have always been in favor of slow travel. Parts of me also tells me to travel while I can (health & politics). Also I am very restlessly exploring my (marvelous) hometown when I am not abroad as well – so I guess the travel racing is sort of inborn. Man, you really do know how to travel, Norman. Spas in Austria and I know you’ve ventured throughout various other continents. I know you’re not racing but you’re certainly keeping up with some pretty cool stories. Thanks for stopping by and commenting. Really enjoyed reading this post! Great work! Really great post! There are so many times that I feel like I am running a race. There are so many places I want to visit and experience but like you said, am I truly experiencing them? This year my boyfriend and I agreed that we would stay in out home country of the US and explore around here a bit more. So far it has been great! Wow, very cool to hear you’re also staying at home to explore your digs. Which part of the US are you from? Either way, I hope you find some stuff you’d never seen before here. Thanks for commenting! I love this! Very timely. Among my friends, I’ve noticed that people feel like they need to keep going to distant countries or on RTW trips for it to be considered travelling. It definitely becomes a race. All travel is worthwhile, even if it just involves exploring new corners of your own beautiful country. “All travel is worthwhile,” I love this, Grace. Thank you for inspiring me through such a kind and thoughtful comment. I’m happy there are other people out there who share my thoughts on this. Thank you for stopping by and take care until we talk again. All the best. 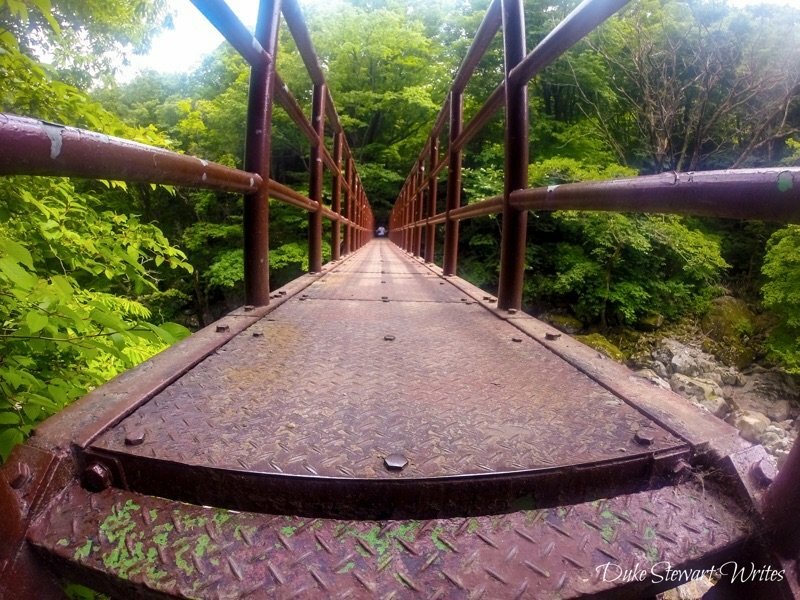 “To travel at my own pace” – this sounds like great advice. It is sometimes a struggle to do so… but I try. There’s nothing wrong with travelling slowly and taking your time. I think teaching abroad is a great way of spending a lot of time in a country and getting to know the culture. I think more and more people realise that speed travel and ticking things off a bucket list is not a very good way of travelling. I totally agree with you, Jo. Living and working in a country is definitely the best way to explore it. I know that my personal views on Korea and Japan are much different from the other places we’ve only visited for a week or so as tourists. I think everyone should spend at least a year or two away from home. Thanks for stopping by to leave a comment, btw. Hope to stay in touch! Sometimes it does seem like a competition rather than for the love of it. I see that in my passion – hiking – as well. People doing it faster and longer rather than taking it all in. To each their own. Yeah, I agree with you here, Heather. I keep seeing some wonderful accomplishments by people and thinking “Did they get to stop and enjoy those 100+ countries” while envying them at the same time. Hiking is like that too, huh? Is it in mountains hiked or just with distance? Very interesting that you bring that up. Thanks for stopping by. It’s hard to juggle, huh? Time vs. slowing down to enjoy things. Do you place yourself in the middle of that spectrum then? I find myself leaning that way but if time/money were no object, I’d slow travel my way throughout the world for sure. Thanks, Jacomijn! Hope to stay in touch! Nice post! It is so easy to get caught up and keep comparing yourself to globetrotters. For us, the travel happened after years of planning. We also knew we needed a base and chose Seville. Affordable, leaving us money to travel some more. I always tell people we just changed address, we still have to pay bills, etc.. I like crossing things off my ever growing list, but l admit l can’t do the crazy on the go kind of traveling. I need a base. Hey, Seville! That sounds like a dream base, if you ask me. It’s interesting that you mention years of planning. My wife and I sort of jumped into the Korea thing (teaching ESL) head first and have come back home, basically trying to settle here. Maybe I’ll take your idea and start planning now. Just out of curiosity, how many should I intend to use for planning? Thanks Kemkem for your kind words. I really liked reading this post. I sometimes feel like we are behind, but why? Probably because I am travel racing! Haha, but seriously the travel bloggers that are doing well seems like such an unattainable thing, but really they are the inspiration that makes me want to go to new destinations. I do find myself being jealous sometimes, I feel like lately instead of feeling jealousy though when I see someone traveling the way I’d like to it’s been inspiration and motivation for me to figure out what the next thing I should be doing to make it happen. It won’t happen overnight, and I need that reminder myself from time to time, but doing things like teaching english and studying abroad is the best way to get your feet wet and save up that money. It really does stink that plane tickets cost so much, otherwise we’d be jetsetting everywhere! Thanks for the great read! Hi, i can add nothing really as Megan has said all that i was feeling and thinking. I am a career woman and just to pack up and go is a huge decision not to be taken lightly. Everything is so expensive, but come what may my dreams will eventually become a reality. Thanks Duke for your stories, really appreciated. This is the reason ive set my heart on concurring my dream. Have an awesome weekend. Yeah, you’re right. I mean you guys are doing well with the savings and whatnot. I feel like even now, I might’ve done better saving money in Korea. Who knows? I always felt like that place was getting more and more expensive by the year but you’ve seemed to crack it. I’m happy with my surroundings for now and since we’ve been applying lots of savings techniques to daily life, I think travel is a possibility even if we’re not rich. Things are meh to a point. All I need is something to write on and something to drive with and I’m good. Maybe a tent too. Hehe. You can see the list growing and growing. I’ve gotta stop! Anyway, thanks for your thoughts. They’re much appreciated!